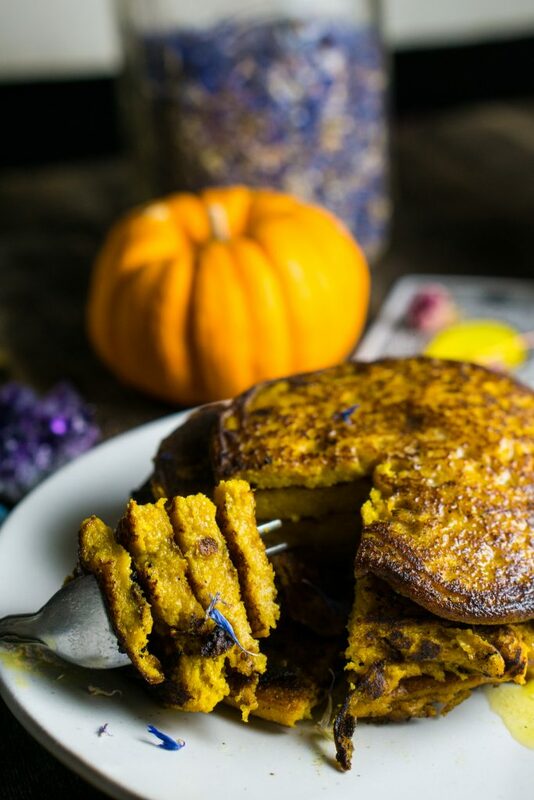 Quinoa Pumpkin Pancakes (body ecology, vegan & gluten-free) are so fluffy, moist and delicious. Yes, I said it, moist. I know the word, everyone despises. 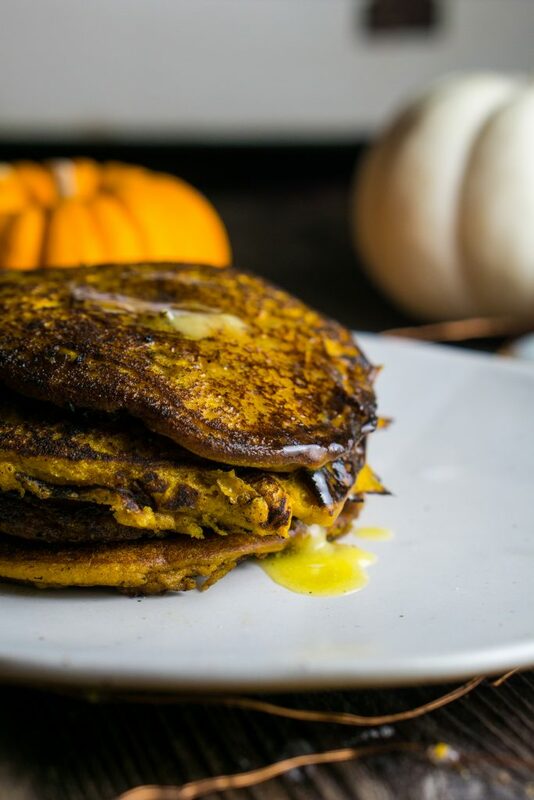 They are literally pillows of pumpkin and quinoa that are literally a dream come true. 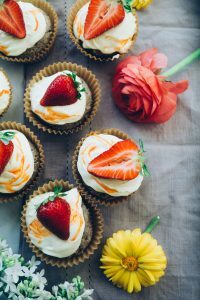 When you first go on a journey to heal your gut, flour is one of the first things out. 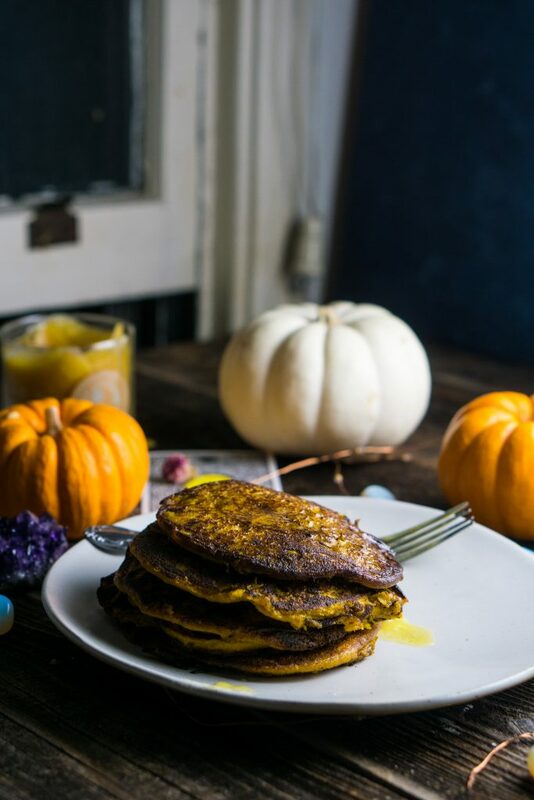 Luckily with some kind of magic I came across, a recipe for Quinoa Pancakes where you SOAK the quinoa overnight, mix with the pumpkin and more magic. Thank goodness for slow cooking, that makes me feel like I’m reconnecting to our ancestors. When you cook the pancakes what gets me so so excited is they bubble just like regular pancakes do on the griddle. 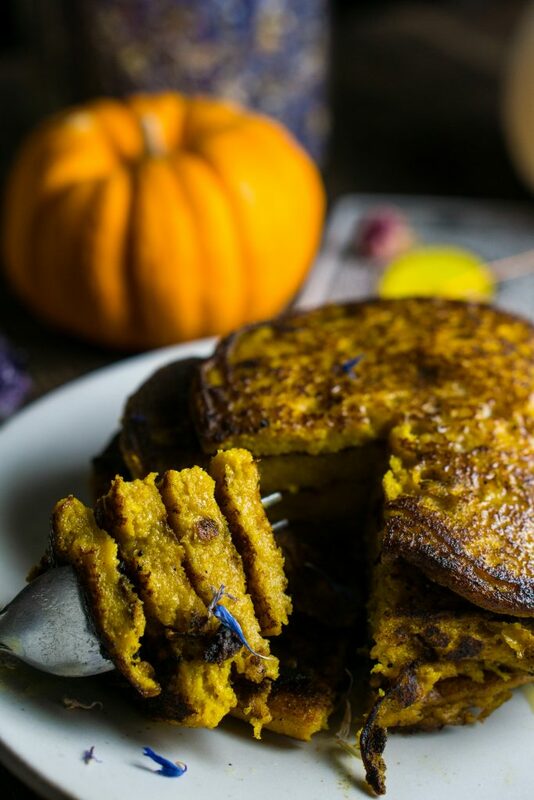 The pancakes flip perfectly, you can even have them for dinner. Being from the Midwest pancakes always have a special place in my heart, we grew up going to Perkin’s to get breakfast and without a doubt, I would order hash browns and blueberry pancakes. On special occasions, my Dad would even make sure the most delicious pancakes, for our birthdays or if we got lucky even on weekend mornings. Therefore pancakes are one of my top comfort foods and bring back all the comforting memories. 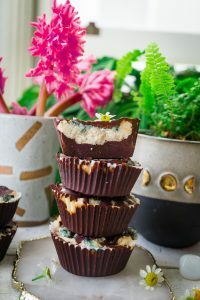 I hope they do the same for you, with the added comfort that they are filled with good for you ingredients. 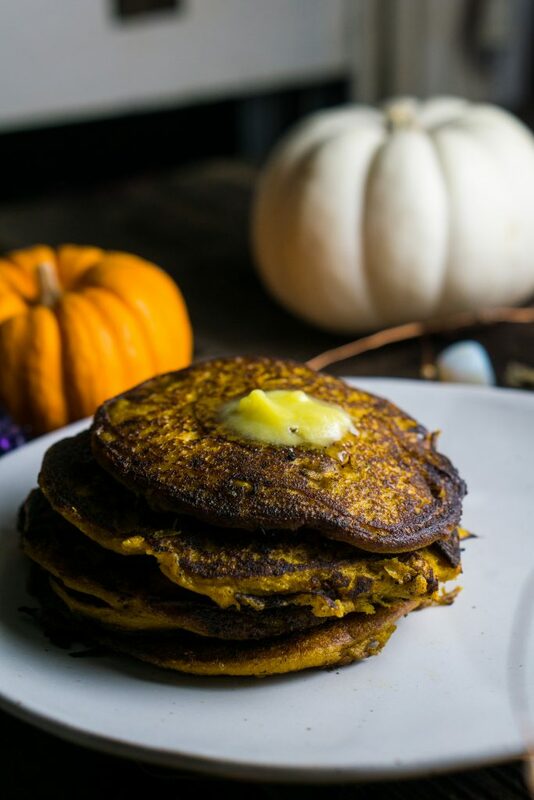 I personally skipped the maple syrup as I find the pancakes sweet enough with the added pumpkin puree, and drizzled ghee on top. SO HEAVENLY! 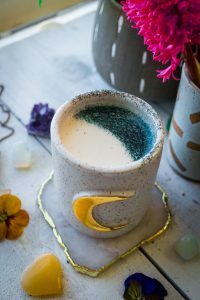 This recipe is inspired from the blog A True Story: A Day In The Life, where you can find her journey on body ecology and some lovely recipes sprinkled into her blog. 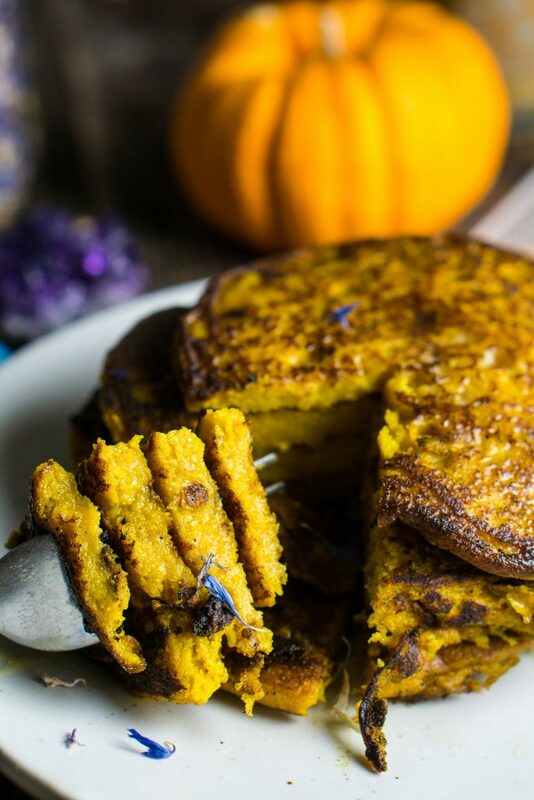 Whether you are on Body Ecology or not I promise you these pancakes will not disappoint. Dan and I gobbled them up and started soaking out next batch of quinoa right away. We also hope to make these with family the week of Thanksgiving. Soak Quinoa overnight in purified water. The next day, drain and rinse the quinoa in a strainer. Place into your blender or food processor. Add in the washed quinoa, almond milk, and apple cider vinegar. 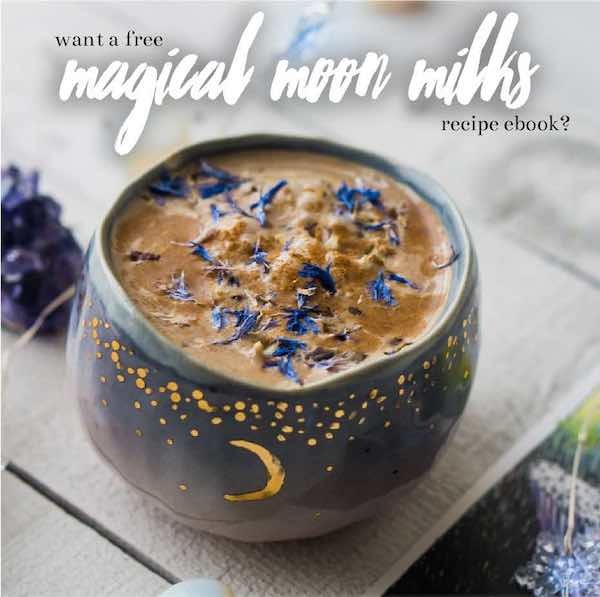 If you need more liquid you can add a splash of almond milk until it is able to blend smoothly, but not too much because you still want them thick enough. Add the rest of the ingredients until fully smooth. Add ghee or coconut oil to the skillet. Scoop out the batter in 1/2 cup measuring cup increments onto skillet. Wait for the pancakes to bubble, each side takes about 3-4 minutes, the middle will take a little longer. Flip and cook until desired texture. Top with desired toppings like chocolate chips, edible flowers, syrup or ghee.